Facebook is rolling out a new feature that allows users to make changes to their comments on the site. The option to edit will show up on any comment you post but it doesn't look like you can actually change status updates, so you'll still have to be careful with those. 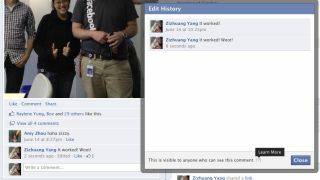 Not everyone will have the edit function just yet, as it's rolling out to Facebook users over the next few days. Update: Facebook tells us that the comment editing history will be available so "people can see the full context of the conversation" (see main image), thus preventing you from carrying out mischevious Operation Make Your Friends Look Like Idiots as outlined below. Spoilsports. On behalf of drunken, fat-fingered smartphone users everywhere, we would like to express our eternal gratitude for this new feature and only quietly question why we weren't just allowed to do this from the beginning. Now, go and abuse this new function to make your friends look like idiots, we're fairly confident there's a way. If only someone could convince Twitter to do the same thing, we could avoid embarrassing typos forever.